I'm very excited to announce my next artistic venture - I will be recreating Jean-Honore Fragonard's The Swing. This has been part of a project I've been planning for at least three years, each time I came close to starting something got in the way. I first came across the painting in my youth, age 13 or so. I was actively researching Rococo art when I came across The Swing. What struck me was that I was captivated by this single moment in time and all its nuances effortlessly captured in the amount of details and textures. There was a whimsical sense of debauchery and a hidden narrative which made it so fascinating. I couldn't help but keep returning to it as the years passed, discovering something new about it every time. This painting came in and out of my life quite often, in little coincidences and mentions throughout my teenage years. The most major of these probably being the utter shock of walking into a room and suddenly coming face to face with a physical presence, a magnificent reincarnation.. The Swing (after Fragonard), Yinka Shonibare, MCA 2008 Sydney, Australia. I stood breathless in front of it, feeling stunned at its boldness. It's not every day you see your favourite painting made into a lifesize real 3D form. I was 17 at the time, and already very emotionally connected with the painting through familiarity. It was one of those times additional information wasn't necessary, a piece that already spoke to your soul and was already a part of you. I regularly visited the Museum of Contemporary Art and the National Gallery in Sydney, sometimes even weekly. The MCA was especially wonderful as it was so centrally located; you could pop in and enjoy the blissfully cool air conditioning and lavishly wander through one of the many galleries while you were waiting for friends to arrive, sometimes catching a curatorial talk. Seeing Shonibare's unique piece and existing in its physical space is a memory I will never forget. 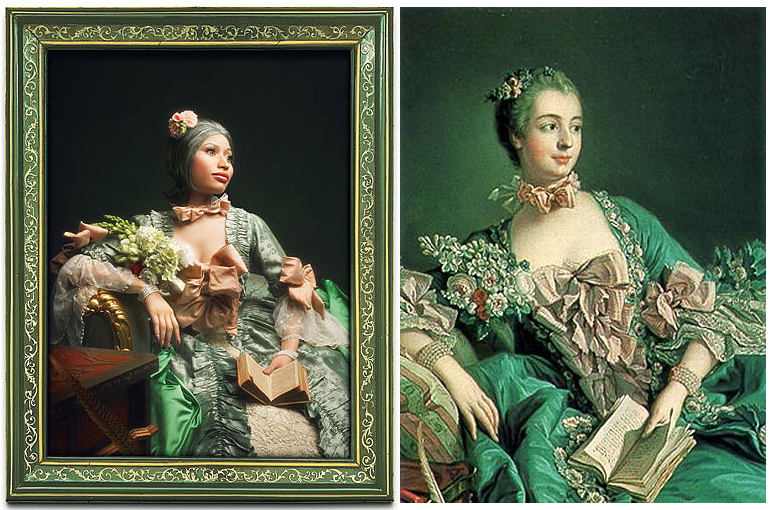 As the years went on, I noticed many Baroque and Rococo elements becoming more prevalent in pop culture, (in my opinion) after the explosion of the film industry's long-reigning fairytale theme. It's great that our sense of fantasy often goes hand-in-hand with some kind of connected historic aesthetic like castles [historic architecture] or costumes [couture-finished finely detailed garments], or myth and legends [trolls, dragons, sea monsters]. It's inevitable then, that with more widespread information, and ever-advancing technology, we would reinvent and recreate things better than before. 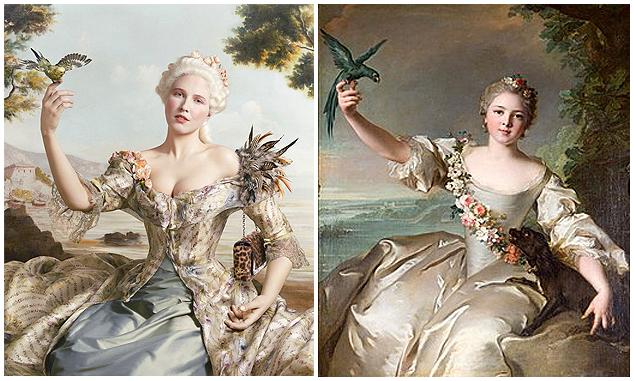 Direct parodies of Rococo art started emerging and spreading into the world of fashion and celebrities in a bid to replicate the unattainable perfection that these paintings possess. 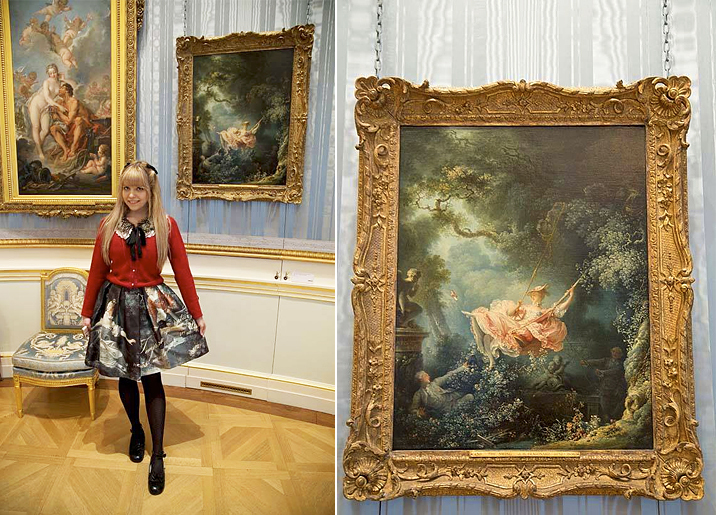 On a brief holiday to the UK in 2013 I made sure that I would stop by the Wallace Collection in London and see The Swing in real life. It was another big moment, the feeling of being in its physical space was just exhilarating. Of course, nowhere online really mentions how small it is! That was my first impression. She was a rosebud amongst some foliage from a distance. It was hiding very cheekily in an upstairs gallery room. The entire museum was such a delight to explore, and it was such a treat to see the painting and its surroundings that day. In 2018 I am thrilled to be jumping back into fine art photography and digital art after a long hiatus due to the busy combination of starting work full time, severe stress in personal life, and also taking a break from creating art. I hope you're all enjoying the new-look website! This has been a decision I have been planning for many months, and I'm so glad it's now live - still a work in progress though. As well as photography, I am also showcasing my other personal interests, and exploring a new medium in the form of taxidermy. I believe that all my interests and different art forms are relevant to me as an artist and my story. I'd like to further reflect on my practice. My inspiration for photography comes from essentially everywhere EXCEPT photography! Throughout my art career I have always considered myself an artist that uses photography as the medium, not a "photographer" in the traditional or commercial sense. This is why I do not usually upload sets or large numbers of images, even though I may shoot many on the day. I treat each image as an individual art work, and thus put all my attention into the top select few of each set. This year is a fresh start and the break away has been important - it's given me a chance to reassess my work from an outside perspective. Since 2007-08 my art has evolved from gothic fantasy digital art, to fashion and portraiture photography, to a combination of both concepts, and finally, to a historically inspired classical aesthetic. I had wanted to post a wee comparison chart of how my work has evolved over time, but sadly (or thankfully?) most of my early art doesn't exist anymore, apart from google images and embedded illegally in youtube videos.. heh. Ten years later, and I am starting to think about the way my artwork is viewed and both the reason I create, and who I am creating for. I would like to thank all the countless talented people I have collaborated with during this period, the models, designers, makeup artists, hairdressers, assistants, as they have all helped to shape my vision and refine my tastes. This year I am focusing on one single all-encompassing project, one which is going to take much research, require a range of skills outside of photography, and one which I have been planning for the past three years (no joke!). I'm thrilled to be starting it now; this year was definitely the right time and I'm glad I held out. I will announce it in my next blog post! I will be writing blog posts regularly, utilising it as almost a digital art scrap book/folio where I can post about shoot planning, problems I am currently facing, progress shots, and background research. Why keep all these things in a folder on my computer hidden away when it's more interesting to learn about an artist's practice and methods, and perhaps pick up a few tips along the way! It will also help document the amount of work involved in what I am about to embark, especially since I can only work on it in my spare time outside of work/life pressures. In essence, the blog will be a one-stop-shop for all things BTS! Thank you for your support from the very bottom of my heart.